Welcome to my useful links page! I created this page in order to provide you with webpages which I consider useful and visit regularly. I have included a description with each page to further aid you in choosing where to go. goracing.com - Official sales website of Action Performance Diecast. The best place on the web for NASCAR diecast. Jayski's Silly Season Site - I frequently visit Jayski for the latest news, paint schemes, and general statistics. This is definitely the best general NASCAR site! 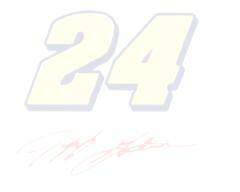 JeffGordon.com - Official site of Jeff Gordon. Includes his biography, neat desktop wallpapers, past results, press releases, photo galleries, and a page for the upcoming weekend's race that includes comprehensive coverage for all weekend events. Jeff Gordon Fans - Message board created on January 8, 2003. Already has many members and messages. The administrators and members keep their audience very well informed. Check out this quickly-growing Jeff Gordon online community; the owners really have a good thing going here. LowesRacing.com - A division of the Lowe's website. Has tons of information, news, and pictures of Jeff Gordon and Jimmie Johnson. Sign up for free and receive a quarterly magazine in the mail that covers both Jeff and Jimmie's personal and racing news. Most Popular Driver voting - Visit this page every day to vote for Jeff Gordon (or your favorite driver) to be the 2003 Most Popular Driver. The initial vote is kind of a pain, but after that, all you have to do is click one button or enter your e-mail address. Voting ends November 17 at noon. Let's vote every day and spread the word to see Jeff win the only award determined solely by the fans; it would mean a lot to him! NASCAR.com - The official site of NASCAR. I go to NASCAR.com for points standings, results, news, and to chat with drivers. Race Fan TV - Lists EVERY televised auto-racing event over a span of approximately two weeks. Tim's Jeff Gordon Page - Tim has quite a site here! It contains news, cool pictures, a generous helping of stats (which I know you all love! ), a guestbook, and much more! Wes's Jeff Gordon Collection Site - A diehard Jeff Gordon fan's collection of JG cards, diecast cars, and even an ice-cream container. Wes has nicely documented his collection via pictures that he has posted on his site. Blackhole Motorsports - An excellent site to visit for downloading files (cars, tracks, utilities, setups, etc.). Virtually all racing games are represented at the site. CUPCARS - Hosts NASCAR 4/2002/03 files (tracks, cars, car number fonts, templates, paint overlays, patches, and much more). DirtComp - A great site that has both Dirt Track Racing and DTR Sprint Cars downloads. For DTR, DirtComp has open-wheel modified and late model chassis and skins, as well as tracks. For DTRSC, it has chassis and skins. DirtWizard.com - Dirt sim supersite. Contains DTR and DTRSC skins, chassis, tracks, and more. EVRacing Motorsports - DTR/DTRSC website that provides excellent guides for tuning, racing, painting, and other aspects of the games. Also has custom skins, utilities, and setups. FIREonDIRT - Home of the original DTR Open-Wheel Modifieds add-on. Has car-painting templates, skins, chassis, setups, and series. Also covers the world of actual dirt racing. Holly-Ridge.com - Downloads for about every computer auto-racing game, especially NASCAR 4/2002. Hustlin' Hoosier - Tons of DTR/DTRSC skins, tracks, and utilities. Lanzock - NASCAR 4/2002 site that has cars, decals, templates, layers, and numbers. nascarnet.com - Easily the best racing sim site on the 'Net. Users upload files for others to view and download. As a result, this site has many more downloads than the next best site. And with users uploading files, you would think the quality is compromised, but it is certainly not that way at all. The files (cars, tracks, etc. - mostly NASCAR 4/2002/03) are the best on the Internet and if you have not visited, you are missing out. OnlineRacing.cc - DTR/DTRSC tracks, chassis, skins, guides, setups, and decal sheets. On the Edge Racing - Cars, tracks, setups, and templates for all NASCAR sims. Race Day Downloads - NR 2002/03 Season cars, templates, paint layers, tracks, and more. Rubbin's Racin' - Provides NASCAR 4/2002/03 cars, tracks, setups, utilities, and decals. Sim Racing Connection - NASCAR 4/2002/03 cars, tracks, utilities, and links. STLRacing.com - Covers dirt track racing with an emphasis on St. Louis area tracks. Also has DTR Late Model, Modified, and Sportsman skins available for download. The Pit Wagon - A good site to visit for downloading NASCAR 4/2002/03 cars. Waynick Motorsports - Contains a wide variety of skins, tracks, series, and chassis for DTR/DTRSC. 123Webmaster.com - Contains over 3,000 free resources for you to use in your web development needs. No sign-up required! AdDesigner.com - A free service that allows you to generate professional-quality animated banners. Bravenet.com - Free web tools for webmasters. Sign up to get polls, message boards, guestbooks, and other really neat add-ons for your site. CoolText.com - A free online service which provides real-time generation of graphics customized exactly the way you want them. Once again, no sign-up required but it is usually pretty busy! FlamingText.com - Free site that can generate custom webpage graphics and animations. Also has clipart, desktop wallpaper, and many more files. HitBoxCentral - Offers free website analysis, statistics, website traffic analytics, and more. Microsoft bCentral - Offers small business services but I just use it to keep track of how many people have been to my webpages and for the banner exchange program (both free, of course). Tripod.com - Tripod gives you 21 megabytes of storage for free. It also lets you customize the ads you must show (pop-up ads or embedded, plus many more options). Thanks Tripod! CoolArchive - Offers free fonts, graphics, and custom graphics generators. VERY good site. Dewitt Industries' Free Graphics Collection - Free graphics for virtually any use: building a website, creating a presentation, composing a newsletter, etc. This site is where I got my " " animation. Dogpile - Searches multiple search engines with one click of the button. A great time-saver that I ALWAYS use when looking for something on the Internet. FlyteComm - Track flights for free. Very handy when a loved one is in the air and you want to know when they will arrive. Kinda interesting too. Information Technology at WACC - Website of a cool class that I took for two years (Visual Basic). Documents neat student projects, whether the Bears won or lost their last game (crucial!!! ), and the transformation of an iMac into something more useful. Logotype Free - Over 65,000 logos available for download. This could easily go into the "simulators" category since it can be useful for finding a sponsor's logo when painting a car, but I thought I'd put it here because there are other uses for logos. Snyder Log Homes - My grandparents' website. They are a sales representative for Kuhns Bros Log Homes, so if you have ever thought or dreamed about owning a log home, stop by their site. They have pictures, open house info, and info about the materials used to construct each home they sell. Themeworld.com - MANY free fonts, desktop themes, and screensavers. TVGuide.com - If you do not want to get up in order to get your TV Guide or simply do not have one, you can get your local cable provider's TV listings here. Once again, quick, free, and painless. Here's a good use: to find out what NASCAR shows will be on in the next two weeks, visit this page. University of Illinois at Urbana-Champaign - The college I am attending. GO ILLINI!!! WhoWon.com - Covers EVERY type of racing from Winston Cup to your local short track. Wicked Moon - Free online greeting cards and postcards. Background music can be added to the card and text/background colors are fully customizable. Yahoo! Mail - My free e-mail provider. I am allowed 4 megabytes of storage and there are no pop-up ads. I hope you found the links on this page to be useful. Every page on my site is considered a top priority to me, so if you have a link you would like to share, or if you find a broken link, do not hesitate to e-mail it to me. I will respond to your e-mail as quickly as possible.